Health officials revealed on Saturday that another seven people may have been exposed to the virus as authorities faced a second possible outbreak of the deadly disease carried by bats in southeast Queensland and conveyed to humans via infected horses. The latest case came to light on Saturday after ten people began tests last week following exposure to horses with the virus in the nearby Beaudesert area. Four properties are now quarantined at Biddaddaba and Kerry - both near Beaudesert - and Mount Alford, with up to 33 horses possibly infected. Queensland Chief Veterinary Officer Rick Symons said it was believed the first horse was the "primary case" of Hendra virus on the Mount Alford property. Tracing is now under way to determine if the deceased horses at Mount Alford came into contact with any other horses at adjoining nearby properties. 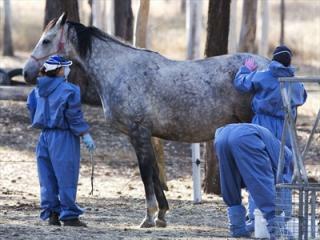 Biosecurity Queensland staff worked frantically to test other horses on the Mount Alford property. The staff also questioned concerned neighbours and instructed anyone approaching the property to stay outside. Biosecurity Queensland staff attended Beaudesert race day on Saturday and several horse events across the weekend at Canungra, Beaudesert, Tamborine Village, Boonah and Logan Village. Meanwhile, the spectre of Hendra virus has spread over the Queensland-New South Wales border and caused a Sydney paceway director to issue a call for vigilance in the harness racing community. At Wollongbar, on NSW's north coast, a horse was put down on Thursday morning after showing symptoms of illness, including a high fever, and its health rapidly deteriorated. It was put down and buried immediately. Laboratory tests later confirmed the presence of Hendra virus. A second horse, which came in close contact with the euthanased NSW animal, is being closely monitored. A spokesman for the NSW Department of Primary Industries said the second animal had shown no signs of ill health and was examined by vets on Saturday. Health Minister Paul Lucas confirmed the outbreak and said all measures were being taken to secure the site and work with those who had been in contact with the animal. Hendra virus, discovered in Brisbane in 1994, is mostly confined to Queensland where there have been seven confirmed human infections and four deaths. It is transmitted to humans through direct contact with an infected horse's tissue. The virus has killed 30 horses since it first emerged causing panic in equine industries. It's a life-threatening notifiable disease which can spread from flying foxes to horses and, very rarely, from horses to humans. Body fluids such as blood, saliva and urine from an infected horse can contain the virus. Symptoms are rapid onset of illness in a horse including increased body temperature; respiratory distress; wobbly gait; apparent loss of vision; head tilting and circling; muscle twitching; urinary incontinence or inability to rise. Hendra virus (originally Equine morbillivirus) was discovered in September 1994 when it caused the deaths of fourteen horses, and a trainer at a training complex in Hendra, a suburb of Brisbane in Queensland, Australia. The index case, a mare, was housed with 23 other horses after falling ill and died two days later. Subsequently, 19 of the remaining horses succumbed with 13 dying. Both the trainer and a stable hand were involved in nursing the index case and both fell ill within one week of the horse’s death with an influenza-like illness. The stable hand recovered while the trainer died of respiratory and renal failure. The source of virus was most likely frothy nasal discharge from the index case. A second outbreak occurred in August 1994 (chronologically preceding the first outbreak) in Mackay 1000 km north of Brisbane resulting in the deaths of two horses and their owner. The owner assisted in necropsies of the horses and within three weeks was admitted to hospital suffering from meningitis. He recovered, but 14 months later developed neurologic signs and died. This outbreak was diagnosed retrospectively by the presence of Hendra virus in the brain of the patient.